If winning the totesport Cheltenham Gold Cup with Imperial Commander and the Christie’s Foxhunter Chase with Baby Run wasn’t enough, the final day of The Festival in 2010 ended perfectly for the Nigel Twiston-Davies stable when 16/1 shot Pigeon Island bought up a 747/1 treble with victory in the concluding Johnny Henderson Grand Annual Handicap Chase. Partnered by Paddy Brennan, the seven-year-old grey, who runs in the colours of Raymond Mould, came with a great run from off the pace to overhaul long-time leader French Opera and Consigliere, prevailing by a length and a quarter on the line. Nigel Twiston-Davies said: “Pigeon Island won seven races two seasons ago and had a good chance on his best form. “Paddy Brennan was confident coming into the race and has been proved right. Paddy picked this horse, which everyone seemed to ignore. “Today has been a very, very special day. It had been a slightly disappointing week before today, although Khyber Kim obviously ran a great race when he was second in the Champion Hurdle. Paddy Brennan added: “The Festival is so important to us and to finish today like this is just fantastic. 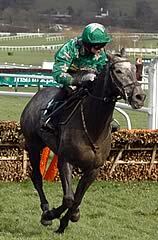 “Pigeon Island had good form as a novice. Although he doesn’t really want this ground, it made it more of a stamina test which suited him. Nicky Henderson, who trained the second-placed French Opera, said: "The irony of this was that French Opera won the Jenny Mould [a race named after Raymond Mould’s late wife] earlier in the year, which is why he ended up with all that weight, and now Raymond Mould has come and won this race."